IIT Madras joined hands with Bosch to establish its centre for data science and artificial intelligence in the campus. Further, the technology giant would be investing ₹20 crores (2.5 million euros) over the next five years in the centre to address core challenges in the field. 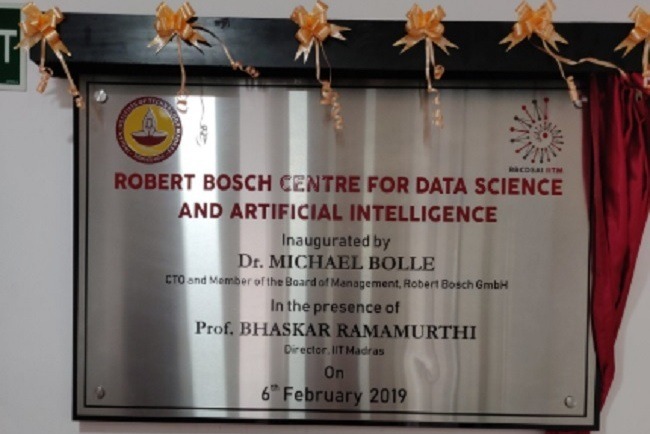 The Robert Bosch Center for Data Science and Artificial Intelligence inaugurated on Wednesday aims to increase the Bosch’s AI skill set while creating societal impact through multi-disciplinary interactions and industrial collaborators on core challenges in Data Science (DS) and Artificial Intelligence (AI). To promote a holistic learning experience for the students, the new RBC-DSAI will undertake foundational research in many areas of AI and data science, namely deep learning, reinforcement learning, network analytics, interpretable machine learning, and domain aware AI. While the primary focus will be given to activities such research projects, knowledge management and setting up collaborative facilities and laboratories. By giving focus on direct interaction with industry expert and other universities, the centre aims to uphold scientific innovations for societal benefit, “The centre’s mandate requires interaction with industry and other universities, including international student and faculty exchanges. The objective is to advance scientific innovation for societal benefit,” says Prof. Bhaskar Ramamurthi, Director, IIT Madras. According to Prof. B. Ravindran, who heads RBC-DSAI, the challenge that the Indian analytics market face is that of processing large data sets to improve accuracy and to adopt emerging technologies like AI and data science for the Indian context. To address these issues, the centre will be curating India specific data sets that are easy to access, “The centre, in addition to fundamental research, is setting out on an ambitious task of creating a portal of curated, India specific data sets that are easy to access and interpret through a set of open tools and interfaces,” Prof Ravindran added. Globally, Bosch is investing 300 million euros until 2021 to optimise their AI processes in manufacturing, engineering, and supply chain management, and to enable intelligent service.